Example 32, A market research group conducted a survey of 1000 consumers and reported that 720 consumers like product A and 450 consumers like product B, what is the least number that must have liked both products? 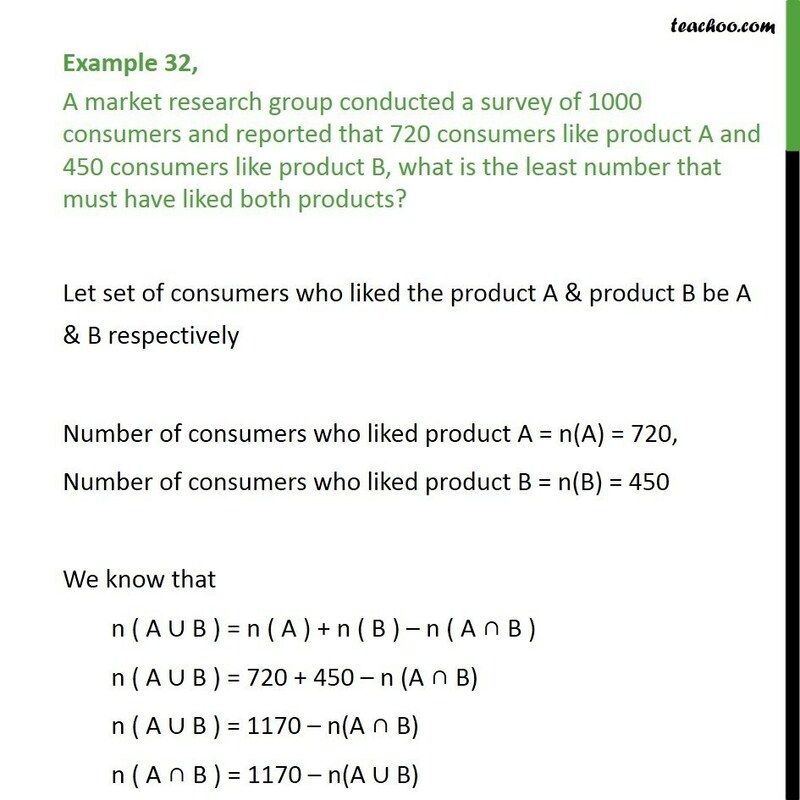 Let set of consumers who liked the product A & product B be A & B respectively Number of consumers who liked product A = n(A) = 720, Number of consumers who liked product B = n(B) = 450 We know that n ( A ∪ B ) = n ( A ) + n ( B ) – n ( A ∩ B ) n ( A ∪ B ) = 720 + 450 – n (A ∩ B) n ( A ∪ B ) = 1170 – n(A ∩ B) n ( A ∩ B ) = 1170 – n(A ∪ B) Therefore, n ( A ∩ B ) is least when n (A ∪ B) is maximum Number of people who liked product A or B (i.e. n (A ∪ B)) is maximum when it is equal to number of people surveyed So, maximum value of n ( A ∪ B ) is 1000. 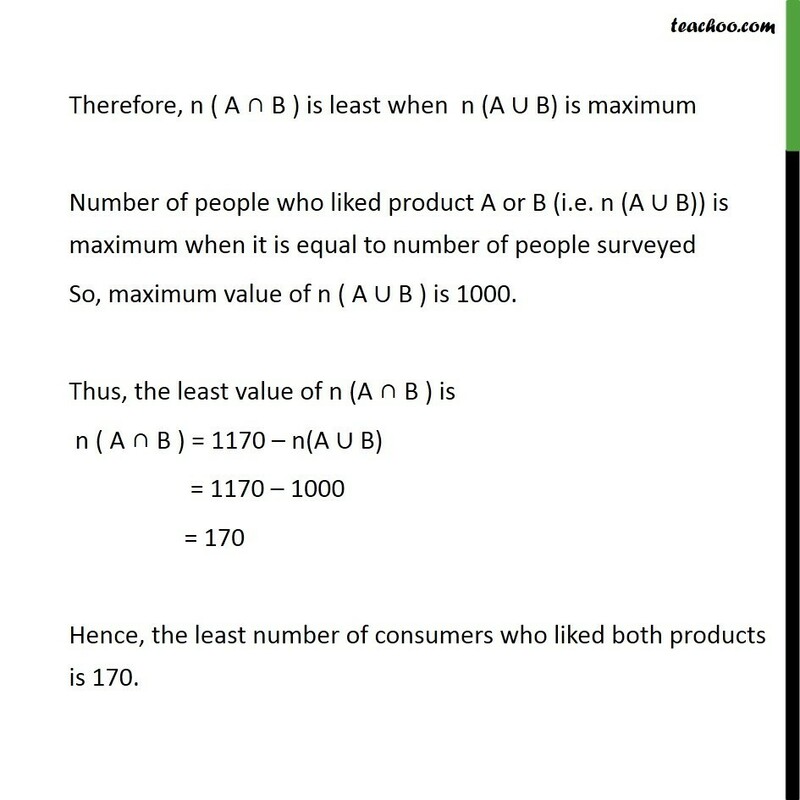 Thus, the least value of n (A ∩ B ) is n ( A ∩ B ) = 1170 – n(A ∪ B) = 1170 – 1000 = 170 Hence, the least number of consumers who liked both products is 170.